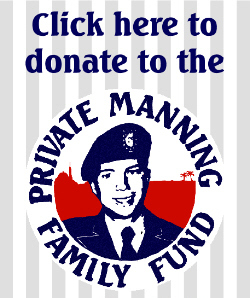 See also A month of solidarity with Chelsea Manning, Part 1. Susan Manning and I set off early on the morning of Wednesday 10 September for the two hour journey to Holyhead and the super-fast crossing to Dublin aboard the Jonathan Swift catamaran that took even less than two hours on an Irish sea still as a millpond (well almost). 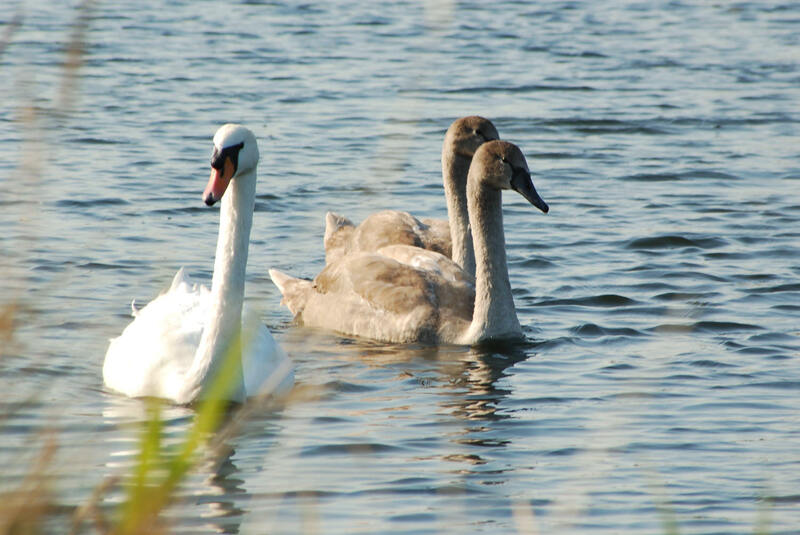 By mid-afternoon we were enjoying a picnic in the sunshine on the banks of the Royal Canal at Shandon in Dublin, watching a family of swans with two nearly grown cygnets and waiting for our host Nuala Kelly to arrive home. Sunshine and warmth were to be features of this late summer trip, which had an almost Mediterranean feel and during which I don’t think I wore my fleece or coat once, even in the evenings. Afterwards, we moved across to The Clarence, the hotel bought and renovated by U2 band members Bono and The Edge in the 1990s. We sat in a room adjacent to the famous Octagon bar, a space with a stone floor and acoustics so poor we could barely hear each other shout, while service at the bar itself was so slow we thought Nuala must have abandoned us or been kidnapped! 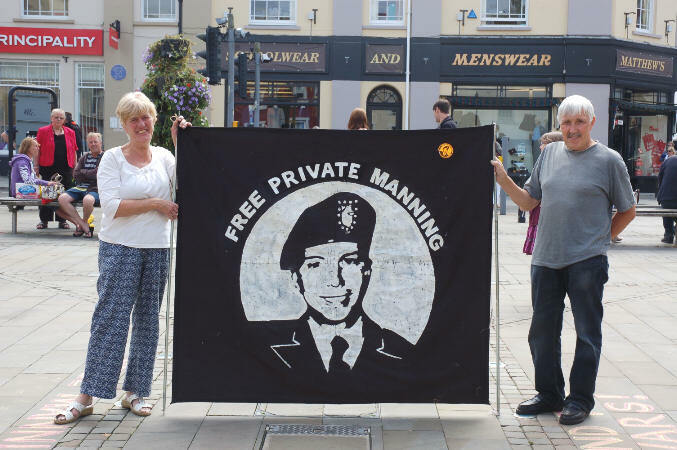 Still, it was good to see Brian and his friends too, who were also solid Manning supporters. Our host Nuala Kelly and her family were out on Thursday so Susan and I entertained ourselves with a late breakfast, a stroll along the canal and around the Phibsborough shops, which are mostly of the secondhand variety, and then walked over to Glasnevin Cemetery in the afternoon. The weather was glorious again, almost too hot, so we took it easy, wandering around unhurriedly, looking at the gravestones and stopping as the fancy took us. Susan is determinedly egalitarian and was as interested in the graves of ordinary people as the many famous graves in the huge cemetery, which was established by Daniel O’Connell and opened in 1832. All cemeteries had belonged to the Established Church since the Reformation and it was incredibly difficult at that time for Catholics to organise burials with appropriate services. 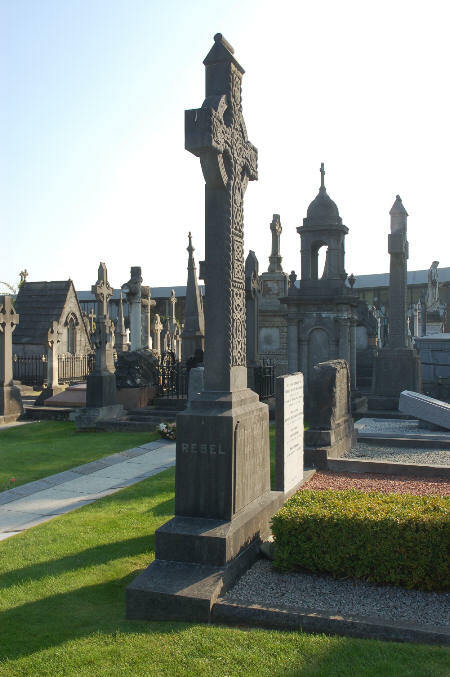 Glasnevin, however, was opened not just for Catholics but for all denominations. We spent quite a bit of time in the area around the Republican Plot at the cemetery, eavesdropping on the guided tours. I took this photo of the Celtic cross on John Devoy’s grave, with the inscription ‘REBEL’ on the side. Looking up John Devoy on my return home, I discovered that he was a 19th century Irish rebel leader (this much I’d guessed) who, from exile in America in 1875 had helped arrange the rescue of six Fenian men who had been Transported to Western Australia and were still being held at Fremantle jail years after most of their colleagues had been pardoned and released. 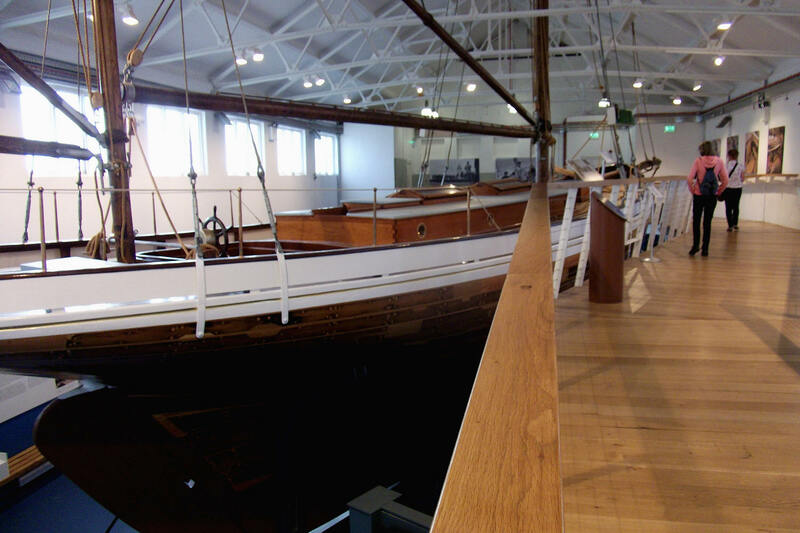 The plot involved the men escaping and rowing out to sea (with the authorities in hot pursuit) to board the Catalpa, a whaling ship with a secret mission to rescue them and bring them to safety in America. 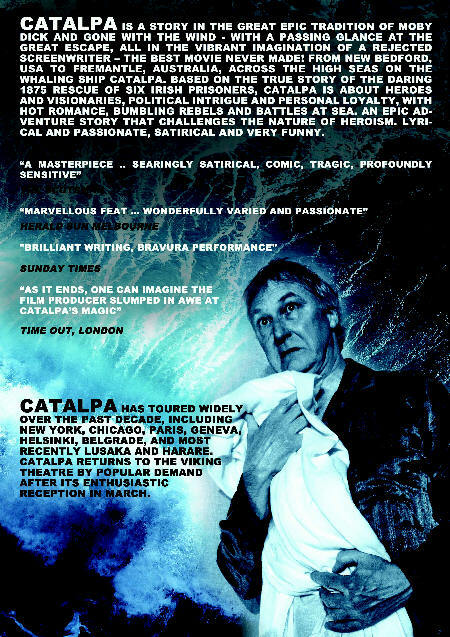 Catalpa… I was already familiar with that name, wasn’t I? A full report on the Resisting Injustice event can be read here. This was an extremely moving evening, full of memories of Gerry and respect for his work, acknowledged with words, music, drumming and poetry. Follow the link above for a comprehensive account and watch Gerry’s speech again below. to provide a focus for the large numbers around the globe who are so grateful to Chelsea for her courage and public service in breaking the deadly silence that surrounds the modern war-machine. We are also horrified that this huge service has been criminalised, and that Chelsea has been ill-treated and deprived of the very peace and freedom she strove to achieve for others. A couple of radio journalists were present at the evening. One, Ann Daly, produced this podcast about the event. Susan and I dropped in to see Joe Murray at the office of Afri in Phibsborough on Friday morning, leaving with a multitude of gifts: a book on the Great Famine for Susan; a brand new Afri publication by Pete Mullineaux Just a Second! ‘exploring Global Issues Through Drama and Theatre’ about Afri’s work with school groups, and St. Brigid’s Peace Crosses to take back with us to other family members. St. Brigid’s Festival or Féile Bríde is one of the annual events Afri is involved with, which started back in 1983 when five lads from Derry learned how to make St. Brigid’s Crosses, sold them and gave the proceeds to Afri. The story goes that Brigid (born AD 485) made the cross while caring for a dying chieftan. On another occasion, when a poor man asked Brigid for alms she gave him instead her father’s sword, advising him to ‘exchange it for the needs of your family.’ This symbolic action is used by Afri along with the cross to communicate a message for disarmament in a world where trillions are spent on arms while millions of human beings die of hunger and hunger related diseases. We spent Friday afternoon at the National Museum of Ireland housed in Collins Barracks; the barracks are situated behind the Croppy Acre, mass grave of Irish rebels from the 1798 uprising whose bodies were dumped here on a piece of land between the barracks and the Liffey. The museum is huge and we focused on just a couple of floors dedicated mainly to Irish clothes through the ages and interior furnishings. Then we walked across the car park to view the restored yacht, the Asgard, used for the Howth gun-running trip to arm the Irish volunteers in 1914 in response to the Larne gun-running exercise in the north that armed the Ulster volunteers. 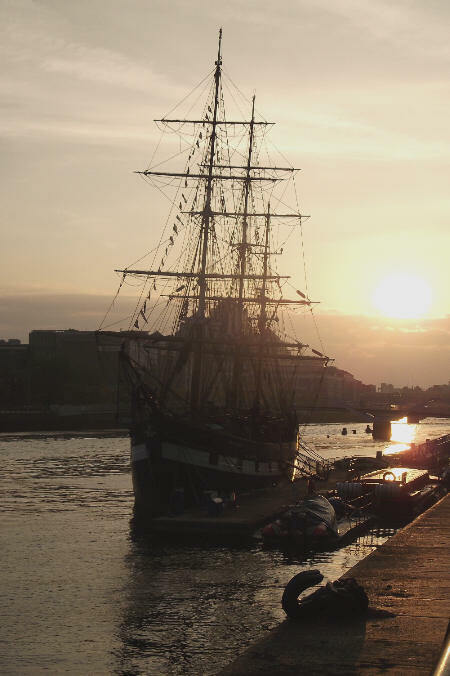 The Asgard went on to be used as Ireland’s first national sail training vessel. 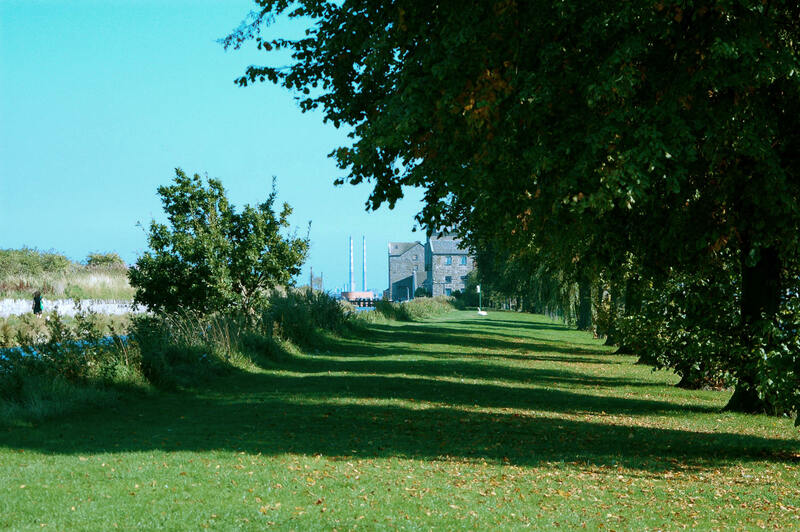 RoJ Whelan called round Saturday morning to take Susan and me to the seaside at Dún Laoghaire, passing the area where he grew up and his first school en route. 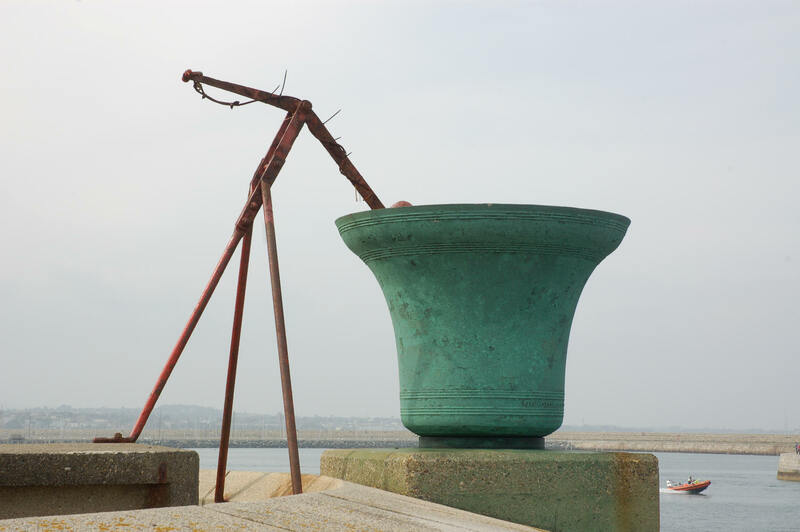 We met Dave Donnellan on the sea front and all took a walk out along John Rennie’s granite east pier, the weather still incredibly warm and still. At the end of the pier was an enclosure with a lighthouse, Teddy’s ice cream stall and a bell on the pier wall, mounted upside down for reasons not yet clear to me. 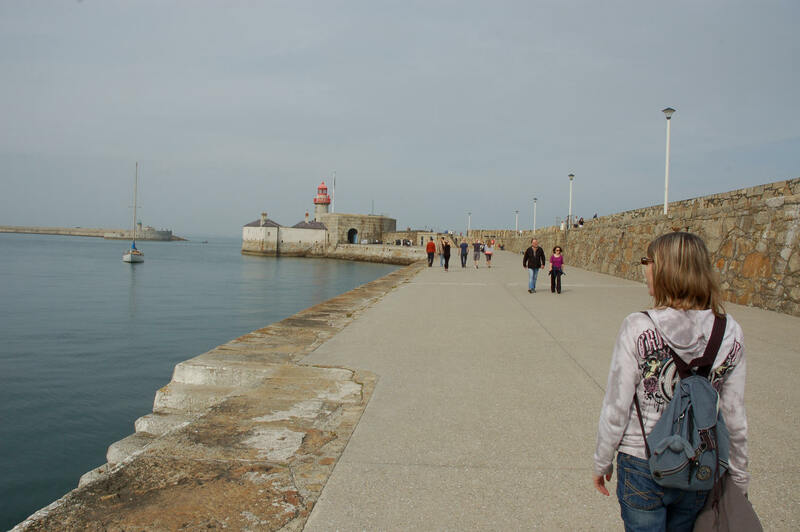 Dún Laoghaire now boasts a new library building, a concrete eyesore that visually and virtually cuts the promenade in half and which appears to have been designed without any reference whatsoever to its immediate surroundings. I’m not going to spoil this article with a picture but you can read about it here. With our combined dietary needs including vegan, gluten free and nut free, I wasn’t optimistic about finding somewhere we could all eat at lunchtime, but I was wrong. I don’t usually do advertising but this could be useful information for anyone with special dietary requirements: Itsa… is a Dublin chain specialising in bagels and with a vegan option right up there on the menu board, offering gluten free bagels too and able to comment on the content of all menu items. It wasn’t expensive and we got to sit outside in the sunshine to eat, which was even better. 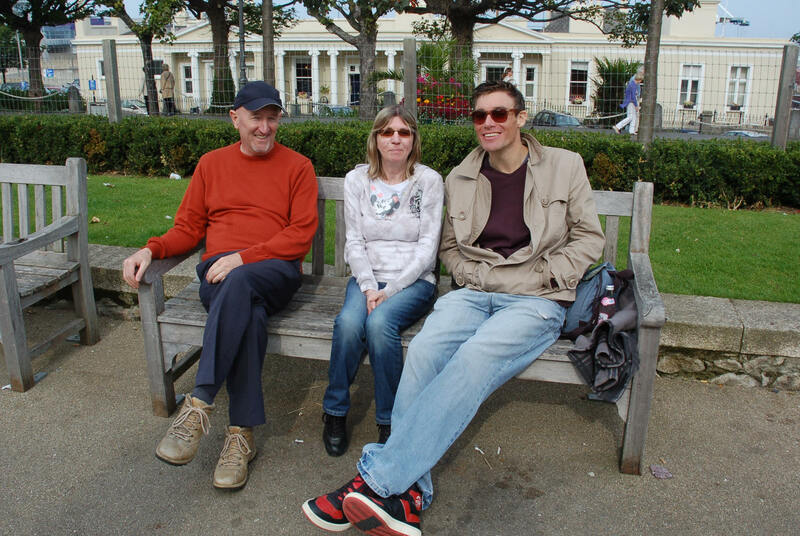 This photo of me, Dave and Sue was taken by RoJ. 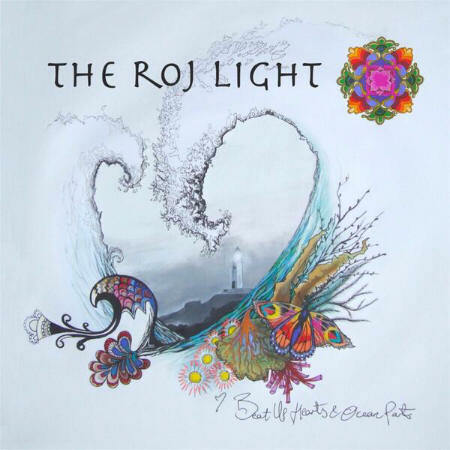 RoJ, who had played for us at the event on Thursday night, gave us copies of The RoJ Light‘s new EP, Beat Up Hearts & Ocean Parts, the beautiful cover designed by Eimear Kavanagh who helped organise the Manning solidarity event in Liverpool last November, provided accommodation for some of the artists (including RoJ) and who had just generously donated towards the costs of this trip. …and the Jeanie Johnston Tall Ship the other. Leaving the restaurant, we slowed the car for a moment by the Famine Memorial on Custom House Quay which Susan particularly wanted to see and compare with The Irish Memorial in Philadelphia she had visited previously. Both equally moving, they are very different representations, the Dublin memorial consisting of a number of separate desperate figures spread out on the riverfront while the Philadelphia monument has a larger number of figures grouped together to depict the people starving in Ireland, embarking for America and finally stepping onto American soil. Back at Nuala’s house, I headed to bed early on account of us needing to leave for Rosslare soon after 5am the next day, but not before we’d taken some group photos to remember our wonderful hosts on this visit. 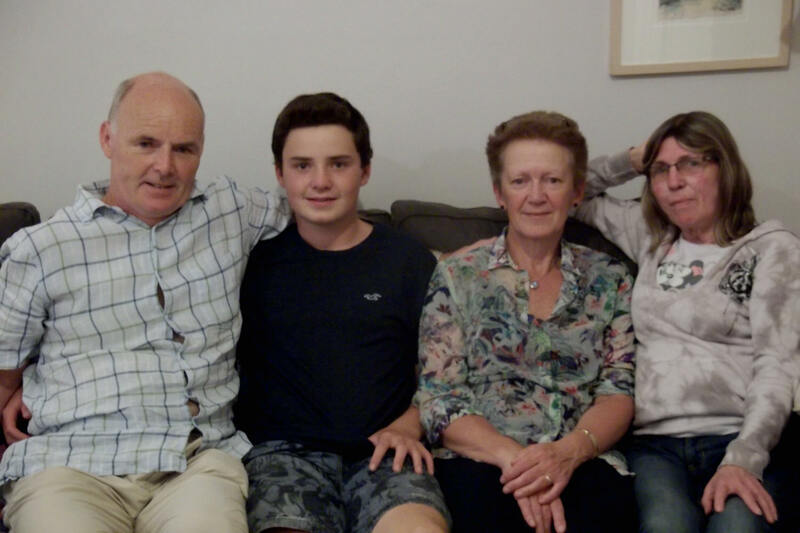 Nuala Kelly and her family had made us feel so welcome in their house and I can’t thank them enough for their generous hospitality that made this visit so comfortable and memorable. 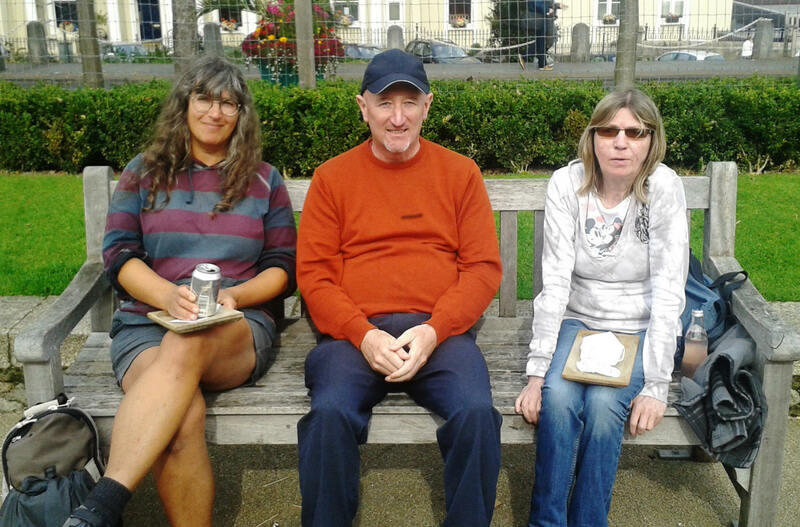 Here’s (R to L) Susan with Nuala, Ultán and Gerry. 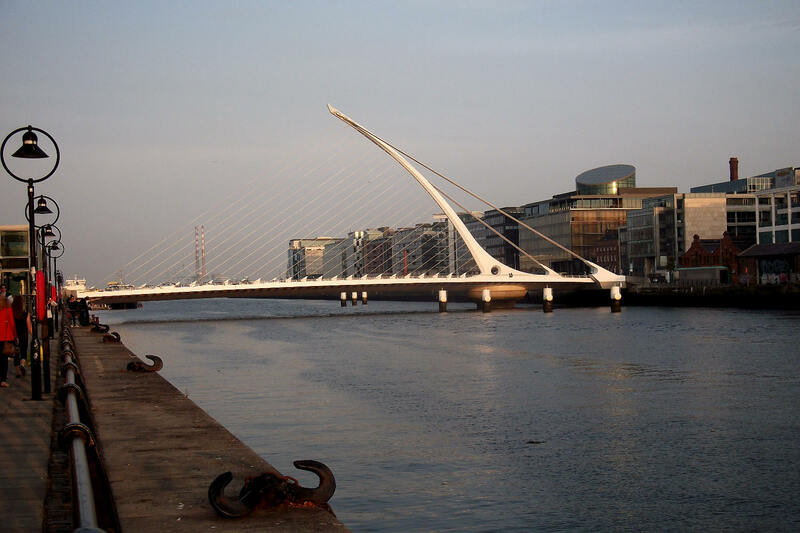 Sunday morning saw Dublin shrouded in fog and we were glad to have Gerry as a guide to see us across the city and onto the Rosslare road; the fog cleared half an hour out of Dublin and we arrived at the ferry in good time. The ferry on the Rosslare route goes at a much more leisurely pace than the Swift and its seats were strewn with sleeping bodies, presumably of people who’d had to get up as early as us or even earlier. 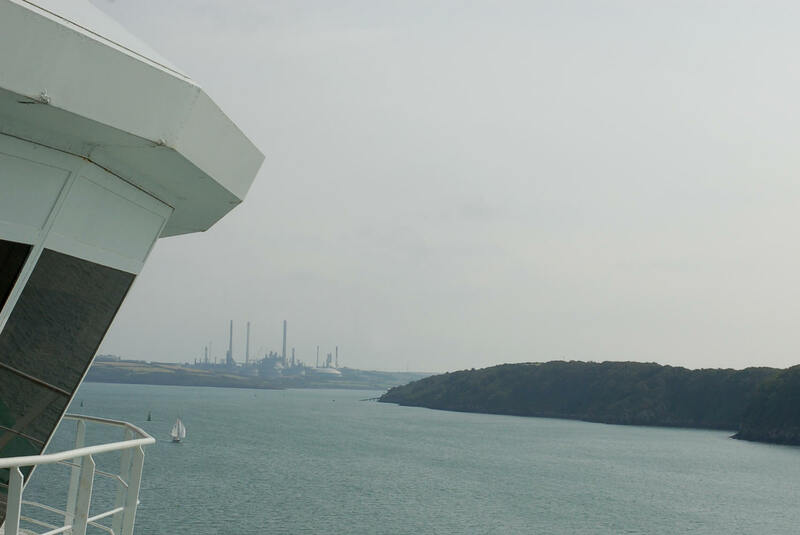 We’d had a good look round most of the boat by the time we sailed into Pembroke Dock but with the early start we were still back on Welsh soil around lunchtime. Leaving the ferry, we stopped off to get a few photos printed for Kevin from the previous week when he and Jackie had joined us in Castle Square (picture below), then I dropped Susan at home before racing off to the coast for a last afternoon at the seaside. The weather was on the change and the waves were crashing onto the beach at Marloes with some force but I waded in up to my chest before – fearful of being swept under with the beach deserted and no hope of rescue – I called a day, changed quickly into dry clothes and hared back towards the Pembroke Dock bridge just in time for a meal at the Jolly Sailor with Chelsea’s aunt and uncles – Sharon, Joe and Kevin – and a night at Sharon’s before setting off for Wrexham and home on Monday morning. Unfortunately, when the west fights fire with fire, we feed into a cycle of outrage, recruitment, organizing and even more fighting that goes back decades. This is exactly what happened in Iraq during the height of a civil war in 2006 and 2007, and it can only be expected to occur again. I quoted from this piece again when, a week later and having taken part in two days for World Peace here in Wrexham in the meantime, it was finally dawning on me that Britain was about to get involved in more military action in Iraq and in all likelihood Syria which, as far as I can see, has nothing to do with saving lives and can only be about moving towards the goal of war without end. Last Thursday 25 September I was back out on the streets trying to make sure there was at least some visible dissent to this latest war that’s already being billed as likely to last for years. 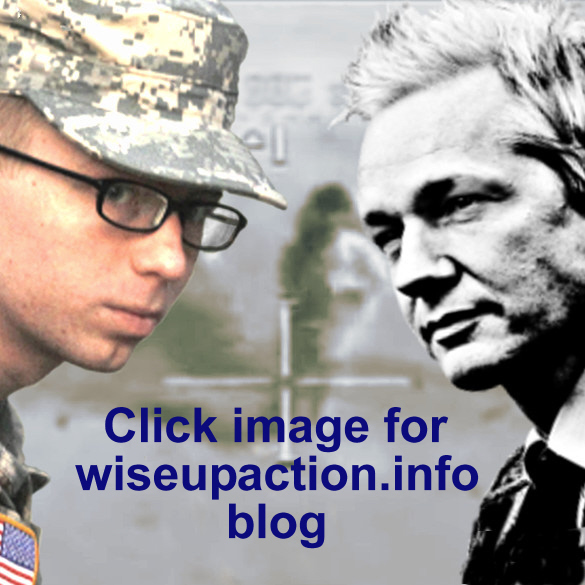 Chelsea Manning gave us all the evidence we need to see for ourselves how wars are fought throughout on lies. It’s depressing that people seem ready to swallow the same old lies all over again and support yet more military action, particularly in Iraq, and we can only hope that this will change when things start to go wrong, as they undoubtedly will. Since Thursday evening I’ve been laid up in bed which has stopped me getting out to protest but has at least given me the chance both to reflect on the Dublin visit and to finish this article. Finally, very many thanks to all who donated towards the cost of the trip which was a real holiday for Susan (pictured below with Dave and RoJ) and which I know she appreciated very much. 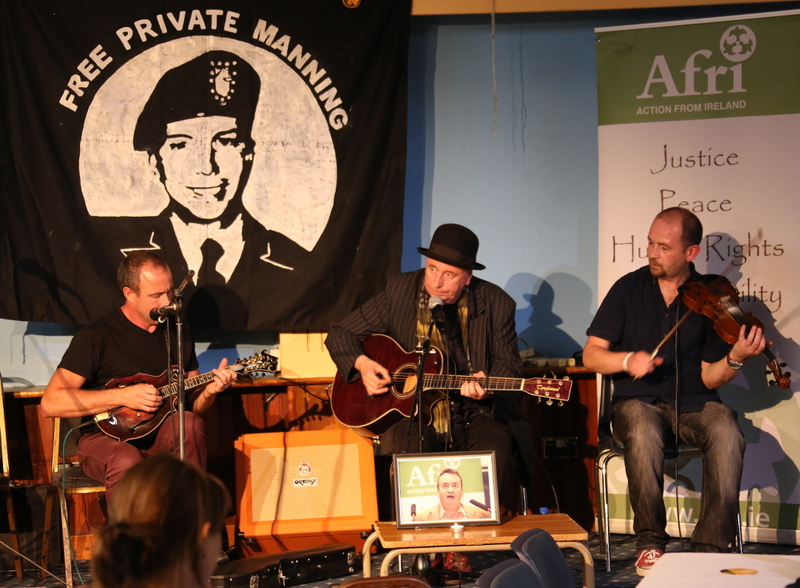 Gallery | This entry was posted in Reports and tagged Chelsea Manning, Dublin, Family Fund, Gerry Conlon, Ireland, performance, solidarity, Wales. Bookmark the permalink. I support Chelsea and I was in Ireland for part of this July and most of August. No one invited me anywhere so I found my own way which is easy amung the very hospitable Irish people. I marched two weekends through the streets of Dublin in support of the people of Gaza. Both were very moving experiences. I also attended the national Fleadh, an 8 day music and history event in Sligo. I finished with a week and a half in Derry and Belfast. For a small Island, there is a lot to do in Ireland. My next trip will be to Dublin during Easter week 2016 for the 100th commemoration of the 1916 Rising. 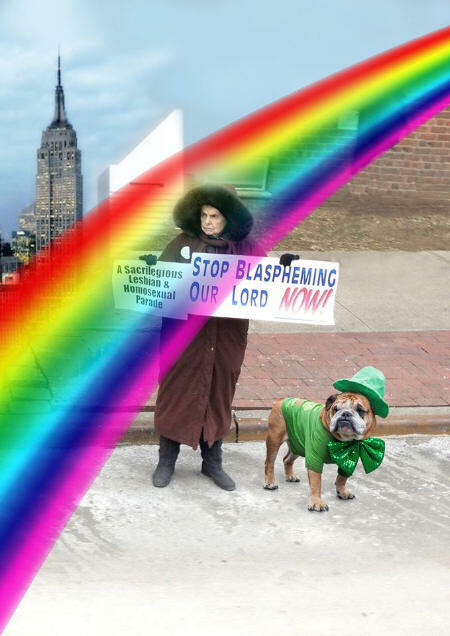 You will find me on O’Connell Street in front of the GPO. I Hope you will join me then.